Click here to preview sample pages from The Chopin Sessions. If you like what you see, click the Buy Now button below to get your copy today. The musical world of teenage piano students is at a crossroads. The internet, the radio, and the television pump out thumping pop music that strikes at the hearts of kids who seek a unique place in our world. But when they play the piano accompaniments for the pop hits that are hammered out on the airwaves, serious teen players are inevitably left disappointed. Unlike the timeless classics composed by Beethoven, Chopin, and Mozart, pop music is driven by lyrics… with the instrumentation serving as a trusty sidekick. That’s about to change! The Chopin Sessions is the beginning of a revolution in teenage piano repertoire. It bridges the gap between today’s pop music and yesterday’s classical masterpieces. 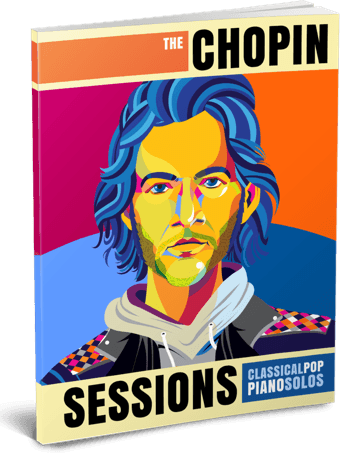 Each piece in The Chopin Sessions is a pop-inspired tribute to the music of Chopin. Whether you use the repertoire to ignite a passion for piano or as a jumping-off point for exploring the classics, The Chopin Sessions is the start of a movement that will inspire the next generation of piano students.